Hi! We’re Miles and Teresa Tuffli of I’m Birding Right Now. Last year, we began volunteering for the PWA’s bird surveys. It’s been so much fun that we decided to document them. Below is the second of these installments. If you missed the first, you can read our December recap here. We’ll keep you up to date with an in-the-field perspective from these monthly counts – check back for future reports! Friday, January 18, 2019 was the monthly bird survey at Ellis Creek. As you know, the Petaluma Wetlands Alliance is “dedicated to the stewardship, restoration, and expansion of publicly accessible wetlands and associated wildlife habitats.” Its monthly bird survey (alternating each month between Shollenberger Park and Ellis Creek Water Recycling Facility) is just one of the many ways the PWA fulfills its mission statement. Tracking the number of bird species (as well as numbers of individuals within each species) provides valuable data that directly reflects the health of the wetlands habitat. January’s survey was originally scheduled for Tuesday, but was rained out due to a series of storms. On Friday, the prospect of a rain-free day greeted the team. When we arrived, everyone was eager to start counting species for the day though there was barely any light. Two Barn Owls flew in and out of the trees near the parking lot – one of the first species of the day! The early bird gets the worm, and the early birder gets the lovely sunrise. Armed with scopes, ‘nocs, and 10 pairs of eyes – we set off on the trail to survey the scene. This Turkey Vulture eyeballed us from its perch as we passed by. Along the edge of the first seasonal pond, a group of Long-billed Dowitchers foraged while quietly chatting about the menu selection. This adult Black-crowned Night-Heron was doing its best impression of an evil henchman. But wait – we also caught this Great Blue Heron doing its best impression of a Black-crowned Night-Heron doing its best impression of an evil henchman! The group encountered these feather remains alongside the trail. Speculation was they were from a Eurasian Collared-Dove. The swift work of a Cooper’s Hawk, perhaps? Our group split into two, and we joined Gene to cover a side trail. We noticed a distant perched raptor and homed in on it. It turned out to be the Peregrine Falcon that Len had earlier spotted in the distance. It was nice to get a closer look. We see you, Ms. Peregrine! Gene picked out a lone Forster’s Tern sitting on the mudflats, and the three of us were delighted when two more flew nearby. As we headed back to meet the group, several Killdeer called loudly from the soggy fields. 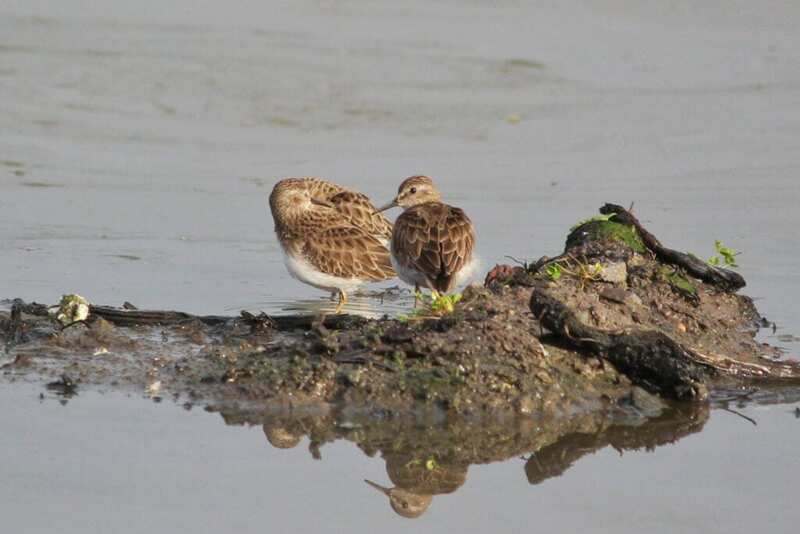 We then came across some Least Sandpipers preening in the morning sun. Ellis Creek is a great place to see a wide variety of ducks. This survey we counted 13 species: Northern Shoveler, Gadwall, American Wigeon, Mallard, Northern Pintail, Green-winged Teal, Cinnamon Teal, Canvasback, Lesser Scaup, Bufflehead, Common Goldeneye, Common Merganser, and Ruddy Duck. You may have already noticed we have a fondness for duck butts. Can you tell which pair of dabblers this is? Whose duck derrières are these? We joined up with the rest of the group as the sun finally poked through, providing nice light for photographs. The Great Egret is a common bird around the Petaluma wetlands, but a stunning one nonetheless! This American Pipit vocalized from a tree, which was interesting since they’re more commonly seen on the ground. The team made it back to the parking lot to say their goodbyes. However, it’s always hard to stop birding – really, when are we ever not birding?? A few of us set off to scour the parking lot for some last minute species to add to the tally. Can’t. Stop. Birding. Umm… you passed your truck, Craig! Wetlands are great, but birds frequent parking lots too. This Ruby-crowned Kinglet posed beautifully and showed off all the field marks differentiating it from a Hutton’s Vireo. 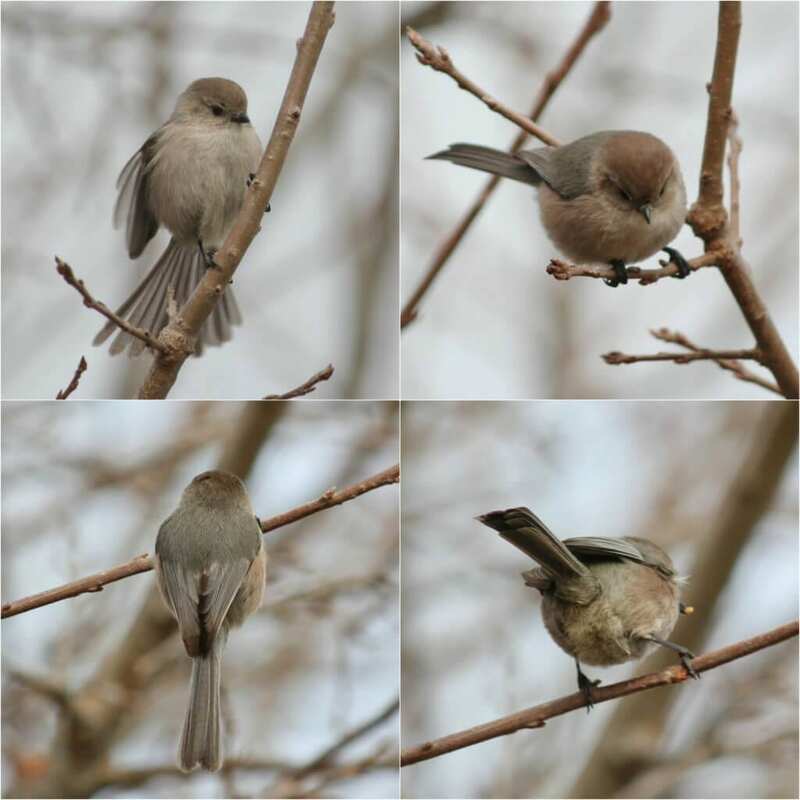 A flock of Bushtits floated through the willows, but not before this adorable male stopped to show off his plumage. By the end of our Friday count, the team had tallied 80 species. On Saturday and Sunday, 11 additional species were located by team members who returned to Ellis Creek, bringing the grand total to 91 for PWA’s January 2019 survey. It was another enjoyable day collecting data for the PWA. High numbers of bird species indicate a healthy wetlands habitat, making for happy bird surveyors! The red-eared slider turtle is the most popular pet turtle and can live over 20 years in captivity, so many have been released by owners all over the world, creating stress to the local native species, particularly our native, the Western pond turtle. "Coyotes are beneficial to our ecosystem since they kill destructive, vegetation eating rodents, which are 80% of a coyote’s diet."